Your Southwest Adventure Starts Here! Owned and operated by Craig and Christine Young, in the tourism business since 2001. 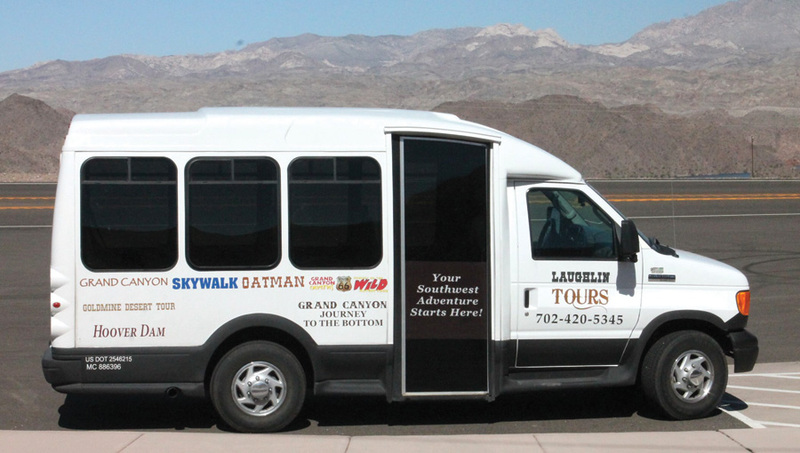 All of us at Laughlin Tours take great pride in providing the best tour available. Actually, award winning tours! Laughlin Tours is the proud recipient of the Laughlin Community Achievement Award for Tourism. We hear people say all the time that Laughlin is such a great alternative to Vegas, and they’re right! Laughlin has so much to offer – gambling – great food – world class entertainment. Terrific deals are everywhere! Besides all that, Laughlin sits in the midst of some of the most beautiful scenery in the world. That’s where Laughlin Tours comes in. When you’re ready to spend a few hours enjoying the great beauty that surrounds you, we’re here to get you there! Along with viewing the magnificent scenery of the Southwest our expert tour guides will tell you about the people, history, animals, plants and geology, and we’re sure to have a few laughs along the way! Tour guide, Transportation and Entry Fees. No surprises – No hidden fees!